Rungkiat Eminent Air was the first Thai boxer I'd heard directly criticize world-famous fighter Saenchai's cartwheel kick. "The way Saenchai does it is dangerous," he said. The problem was that Saenchai puts his hand on the floor when he cartwheels his leg onto an opponent's head. I raised my eyebrows. How else can you cartwheel kick someone without putting your hands on the canvas? "When I did something like that," Rungkiat said, "I waited until the guy had a hold of my kick. Then I flung my other leg over to kick him in the head." No hands involved. It took me a minute to imagine what that would look like in a fight. I almost didn't believe him. It sounded too video game to be real. But it is real and he was serious and that's why Rungkiat Eminent Air is a badass. More specifically, Rungkiat is what you'd call a technique specialist in the art of maemai Muay Thai, classic techniques. Flying knees, which he learned from legendary fighter Jomhod Kiatadisak, are his calling card. 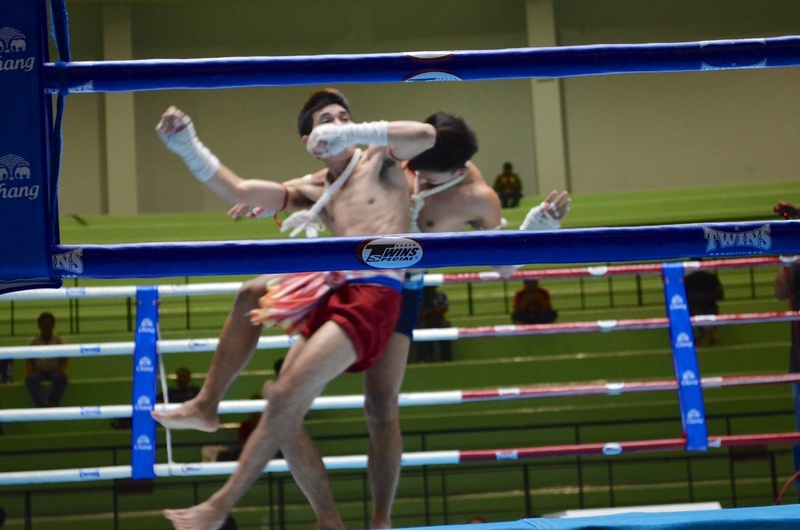 It was his exquisitely timed flying knee that bagged him SMM-TV Muaythai Daily's Knockout of the Year in 2013. Rungkiat developed his style gradually, having started Muay Thai more than 20 years ago when he was six. Now approaching 30, he boasts over 400 fights and the Southern Thailand title at 126 pounds, which he won at age 21, and has since defended three times. He arrived in Bangkok at 22, spent about five years at Kiatprapat Gym, and has been with Eminent Air since last year. Everyone knows him for his gorgeous, acrobatic maemai style. "I adopted this style because I wanted to use it to be famous and to preserve maemai Muay Thai," Rungkiat says. He has a natural inclination for this style—Jomhod taught him the flying knee, but he managed to pick up other techniques from videos and photos of other maemai technicians, then working out the movements on his own. He and his maemai style are a crowd favorite. "The audience likes it," he says. "The foreigners always look amazed and the Thais seem to like it too." The thing is, the maemai style Rungkiat is so famous for used to be what Muay Thai was all about, way back when. 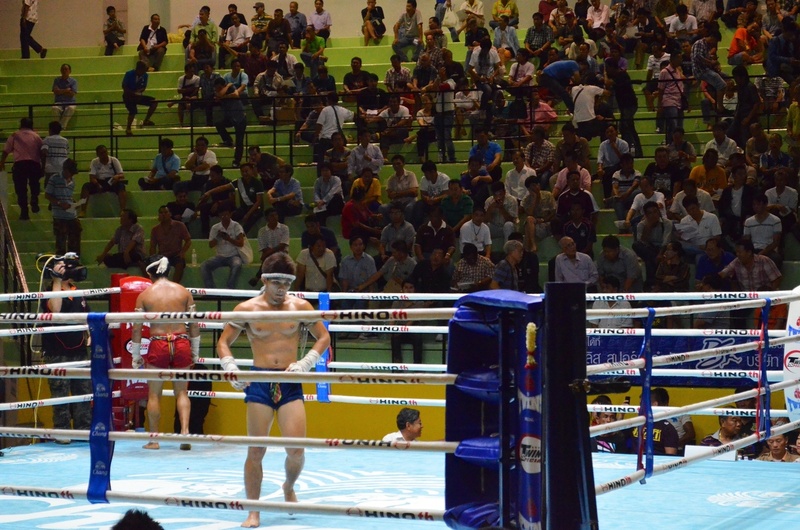 According to Boom Watthanaya, a Thai fighter and gym owner raised in Thailand's northeastern Isaan region, the dictionary definition of maemai Muay Thai is the martial art of Thai boxing, as opposed to the sport style we see today. Boom calls maemai Muay Thai a set of traditional movements and techniques. "Maemai techniques are more complex," he says. "Catching a kick, that's not maemai, but catching a kick and elbowing the leg is." Today's maemai techniques are largely relegated to Muay Boran ("ancient boxing") exhibitions. Muay Boran now plays a role in Thai nationalism but, as Boom says, real Muay Boran fights no longer exist. "One hundred years ago, they just called it Muay Thai. But now Muay Boran is something made up to respect Thai history and the history of fighting." Only a handful of maemai techniques are still widely known today; the surefire crowd-pleaser cartwheel kick, or maa-deit-galok, Horse Flicks the Skull, is one. Young Thai fighters still practice cartwheel kicks, just as they practice flying knees and spinning elbows, but these techniques are not as prevalent in the ring as in decades before. Boom, who recently opened Wor. Watthana Gym in his Isaan hometown, teaches certain maemai techniques to his young fighters. He personally values it, but knows his fighters may never execute many of those techniques in the ring. "Fighters today are scared of attempting maemai Muay Thai because if they make a mistake, they will be penalized," Boom says. "In previous generations, like when Rotnarong [famous for his cartwheel kicks back in the '90s] was fighting, making a little mistake while attempting an awesome maemai technique wouldn't lose you the fight." Boom believes the decline of maemai Muay Thai in modern stadium fighting is due both to fighters' attitudes—"They have less heart and are scared of failure"—and gamblers' expectations. "Judges used to make decisions based solely on the sport, but now promoters are looking at this as a business, and decisions are made to keep the gamblers happy because the worry is that if gamblers aren't happy they won't buy tickets to the fights." He's not the only one who has noticed a shift. Suwanna Srisongkram, Muay Thai reporter and editor-in-chief of Muay Champ, has witnessed Muay Thai in Thailand evolve dramatically over the last nearly five decades she's been covering the sport. "Everything has changed," she says. "The audience has changed, the way judges score fights has changed, the fighting styles have changed. It's all because of business, because of money." Suwanna ascertains that in the old days, fighters focused on perfecting their technique. "They used to care about how to make it a beautiful, technical art, but now they're thinking only of scoring points. Some of the things they do, for example not clinching but throwing, that's not even Muay Thai anymore." It's the gamblers' influence, she says, and the fighters know what the gamblers are looking for. So do the judges. "The judges can't score fights the same way they used to. I've been seeing this shift for the last 20 years." Rungkiat himself is well aware of the difference between his classical technical style and that of most other fighters today. "They're mainly training to be strong in power and the clinch," he says of other fighters. "Judges like to give points to that style. Judges follow the gamblers." Gamblers may appreciate the hard, forward-moving style of many modern fighters, but other powerful entities are looking to preserve classic technique. 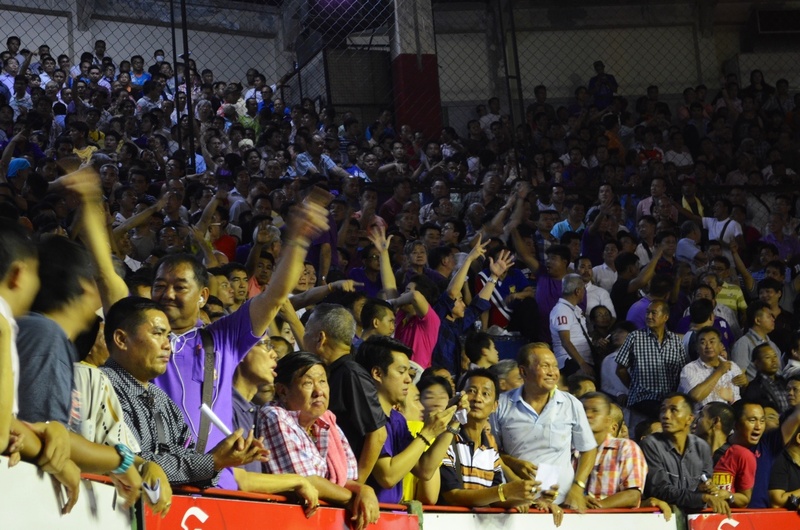 Some stadia have special incentives in place to encourage maemai Muay Thai. According to Englishman Rob Cox, longtime Muay Thai journalist and owner of Kiatphontip Gym, venues like Lumpinee and Rajadamnern want to keep the style alive, and thus pay out bonuses to fighters who manage to knock out their opponent using classic technique. Fighters can earn an extra 10,000 baht (currently about US $280) for a KO by head kick, and a cool 20,000 for a KO by jumping knee or spinning elbow. One of Rob's fighters, Yokpetch Kiatphontip, recently brought home an extra 20,000 baht for knocking out his opponent with a spinning elbow at Rajadamnern Stadium. 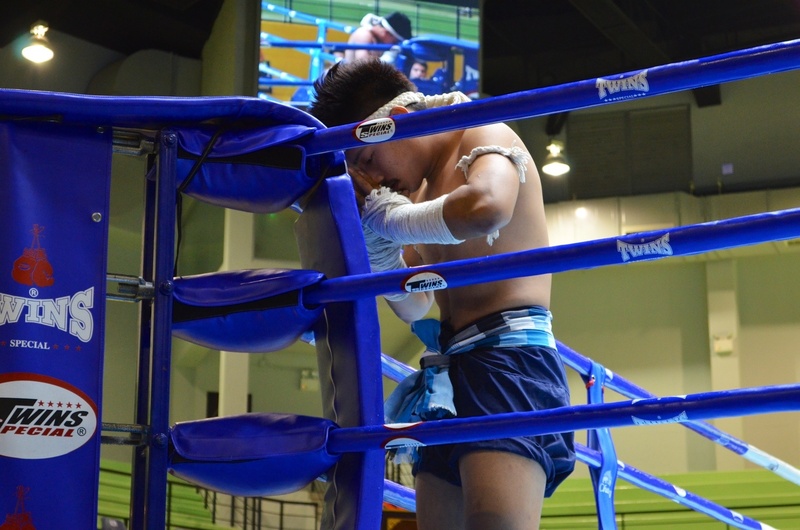 Despite the knowledge of bonuses, few fighters train specifically for this style of Muay Thai, and few attempt these classic techniques in the ring. The challenge then is not in learning the techniques—any reasonably able-bodied person could theoretically become proficient with enough practice—but in executing them during a fight, where it matters. Rungkiat has been teaching maemai techniques to certain students for the past 10 years, since his early days at J Prapa Gym in Phuket. One of his beginning training partners was Swedish Teresa Wintermyr, now a highly ranked champion fighting out of AKA Thailand in Phuket. Rungkiat remembers the Teresa of eight years ago—then only starting her Muay Thai career—as a fast learner. "She was great in training," he says. "She had a great pointy knee. But it was hard for her to pull it off during fights." That's the inherent difficulty in becoming proficient in maemai techniques: transferring the movements from the gym into the ring. Teresa says the challenge is in overcoming natural hesitation. "[It's] waiting for the 'right' moment that never comes, and overall lack of self-confidence," she says. "[It's] mostly mental blocks. I usually stick to the techniques that I am confident will work but I wish I would be able to use my entire array of techniques in my fights. That's what living up to your full potential is really all about." From Teresa's fight record, it looks like she's definitely living up to her potential. She had 19 fights during her stay at J Prapa, and racked up quite a few KOs with the pointy knee Rungkiat helped her develop. Similar in size, Teresa clinched and trained frequently with Rungkiat at J Prapa from 2008-2009. She remembers him as the most technical fighter at the gym, unfailingly impressive in the ring. "He had such a slick style and always looked so effortless," she says. "I remember he fought while sick with dengue fever once and still won." Now almost 10 years later, Rungkiat is living in Bangkok and part of the Eminent Air team. Both foreigners and fellow Thais approach him at Eminent Air during training, ask him for help with a high kick or a spinning elbow or his specialty, a flying knee. While Rungkiat believes virtually anyone can perform these techniques with enough training, he does acknowledge a difference in how foreigners learn. "Most foreigners don't do this kind of technique," he says. "It would take a foreigner a long time to develop this style. You'd have to start when you're a kid, just like a lot of Thais do. Mostly all the maemai techniques I see foreigners doing are spinning elbows." Rungkiat's maemai style is making him famous in the ring, and also setting him up for a nice future as a notable coach. When a group of Canadians showed up on a crowded day at Eminent Air a while back, Rungkiat volunteered to take one of them on pads. "I tried to teach him a flying knee and the Somrak elbow," Rungkiat said of his temporary student. "He could do it, but not like how the Thais can do it." Unbeknownst to Rungkiat, the Canadian he was training owned his own Muay Thai gym back in Canada. He was so impressed with Rungkiat's technique and coaching style that he invited the fighter to come teach abroad at his gym. Becoming a trainer abroad is a dream for many Thai fighters, but Rungkiat has other priorities now. "I want to go," he says, "but I have a son who is almost a year old and I don't want to leave him." Maybe he'll go in three years, he says, after he retires from fighting and his son is a little older. Rungkiat will probably make the jump to coaching after he retires. Foreign interest in Muay Thai is increasingly opening doors for ex-fighters from Thailand to work abroad. When asked where he'd like to teach, Rungkiat mentioned Australia and Germany, then added with a smile, "I'll go wherever I can go to make money." It's a practical sentiment I've heard echoed by many boxers. In the meantime, Rungkiat Eminent Air continues his reign as one of modern Muay Thai's most prominent technique specialists. When asked how others could achieve the intricate style that holds so much Thai heritage, Rungkiat doesn't point to practice or innate talent. He talks about courage. "You have to have the courage to try the technique in a fight if you want to fight in this style. You need the courage to do it in the ring. People do it in the gym all the time, but no one does it in the ring." Behold, the full countdown of SMM-TV's Top 20 Muay Thai Knockouts of 2013. Thai-English interpretation by Melissa Ray, Frances Watthanaya, and Supawadee Ruge.